A variant of the Sharp AQUOS S3 running Android One is currently available from the South Korean network operator SK Telecom. The AQUOS S3 was launched by the device maker back in March 2018, and it initially shipped with Android 8.0 Oreo pre-installed with Sharp’s proprietary skin, Smile UI, running on top of Google’s operating system. However, a Reddit user recently discovered an Android One variant of the device on the website of SK Telecom. The website contains images of the handset running a stock Android build, and the list of specifications of the device states that the AQUOS S3 runs Android One and an upgraded version of the operating system, which is Android 8.1 Oreo. By running Android One, this model of the handset will potentially get updates sooner than other similarly-priced smartphones. This is not the first time that the tech company released an Android One smartphone. Back in January, the tech firm announced the Sharp Android One S3, which is mostly equipped with entry-level hardware components. The Sharp AQUOS S3 is powered by the Snapdragon 630 chipset from the semiconductor firm Qualcomm. This SoC is comprised of an octa-core ARM Cortex A53 64-bit CPU running at a maximum frequency of 2.2GHz and the Adreno 508 GPU. The handset sports 6-inch display with a resolution of 2160 by 1080 pixels and an aspect ratio of 18:9. The smartphone includes 4GB of RAM and 64GB of internal flash storage, which could be expanded using a microSD card with a capacity of up to 128GB. The dual rear cameras of the device are equipped with one 12-megapixel sensor with an aperture size of f/1.75 and one 13-megapixel sensor with a telephoto lens. The front-facing camera, on the other hand, comes with a 16-megapixel sensor. The handset also includes a fingerprint scanner at the back and it also sports a face recognition technology which scans 1,024 facial points and is capable of unlocking the device in 0.1 seconds. To keep its lights on, the AQUOS S3 contains a 3,200mAh battery and it also supports Quick Charge 3.0 for rapidly charging the device. The handset sports connectivity features including NFC and Bluetooth 5.0, and it can connect to Wi-Fi networks running on both the 2.4GHz and 5GHz frequencies. 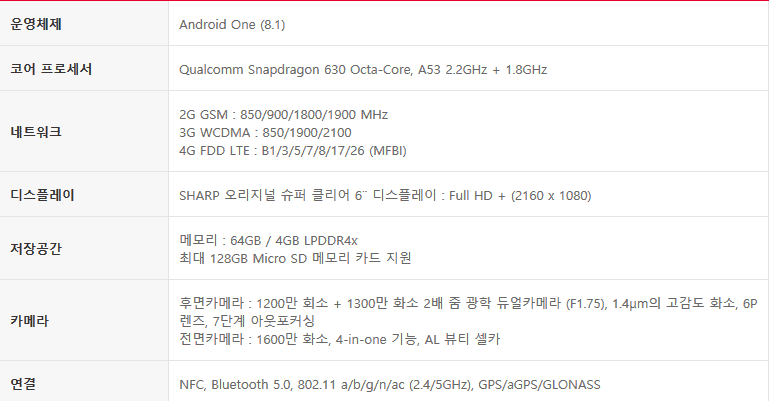 The post Sharp AQUOS S3 With Android One Available In South Korea appeared first on AndroidHeadlines.com |.